For the better part of last year – the part where I wasn’t testing pie recipes, making videos for The Pie Academy, or going over to the beach as much as I wanted to – I was creating and testing recipes for my upcoming book, Comfort Food, to be published this fall by my good friends at The Old Farmer’s Almanac. I was reminded of precisely how much testing while knee deep in a recent tax season review of my food receipts which read, in aggregate, something like a comfort food requisition for a six month pleasure cruise on an aircraft carrier. There are, among other items, mountains of ground beef (think tender meatballs and tempting meatloaves) and enough pasta, eggs and cheese (mac & cheese and other comforting casseroles) to be recognized as a one-man economic stimulus package. 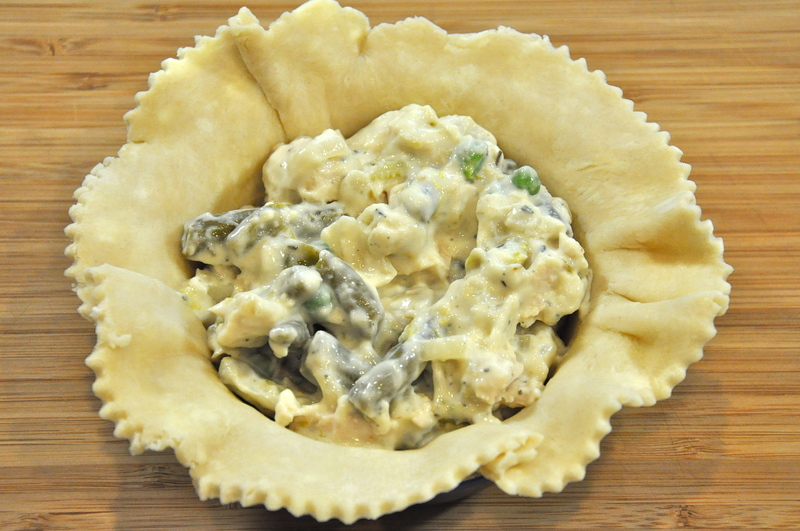 Not to mention no trifling amount of poultry, especially chicken, much of it earmarked for one of my favorite recipes in Comfort Food – chicken pot pie. 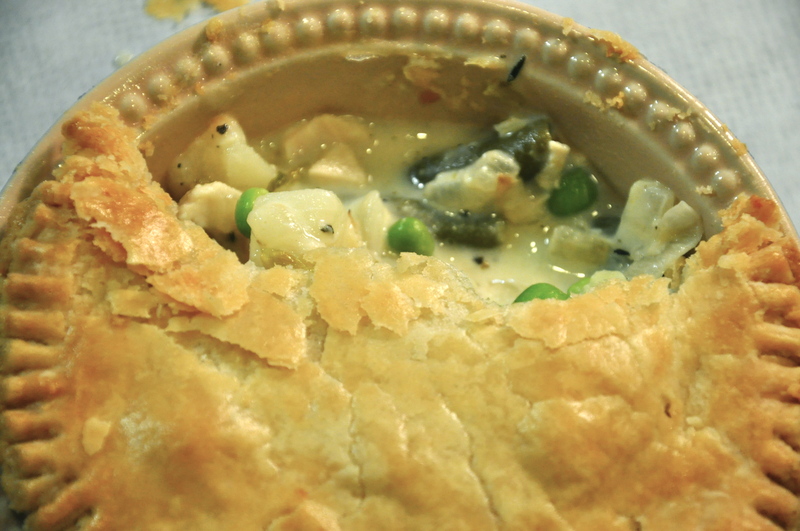 Speaking of simple, chicken pot pie is not difficult to make. No, it’s not as easy as tossing a packaged one in the microwave. But our aim here isn’t instant gratification. It’s gradual gratification, built upon good ingredients, handwork and puttering, and heightened by expectation – your own and that of those gathered. Real cooking, in other words. It’s also an opportunity to trot out some of your favorite individual pie and casserole dishes (which I discuss in the video above). Sure, you can make this as one full size pie. But I never pass up an opportunity to make individual servings, which multiplies the specialness quotient by a factor of at least 10. Several important studies back me up on this. Along with which dishes to use, there is the pressing issue of one crust or two. Do I use just the top crust? Or do I go to the extra trouble and line the pan with pastry, too? – something else I discuss in the video above. But as a lover of all things pastry, I think you already know which side of the issue I come down on. What’s your preference? 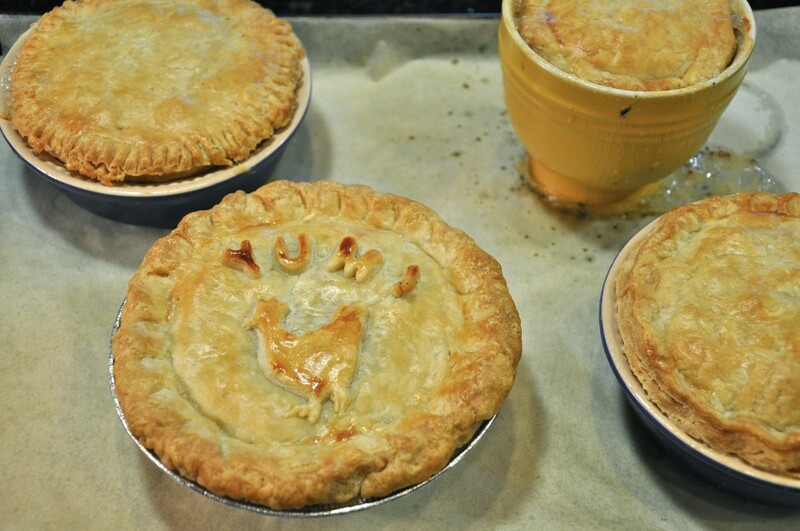 Spring may be in the air, but there’s still enough cool days ahead to try your hand at chicken pot pie. 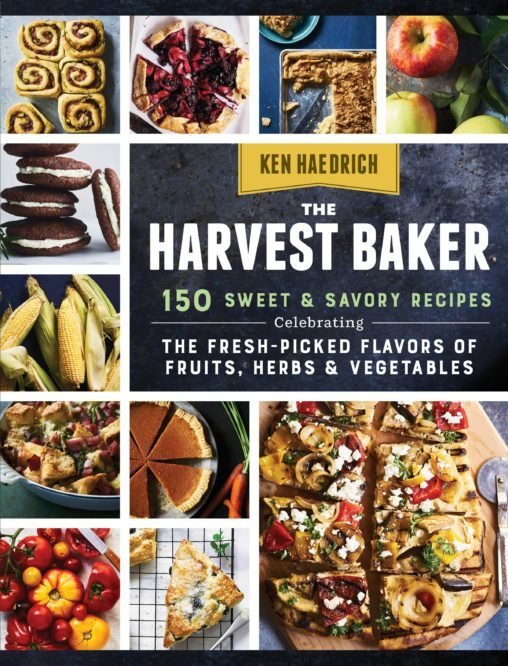 Who knows: maybe you’ll have some leftover chicken or vegetables to use up after this Easter weekend. As I mention in the video, I don’t mind taking a few shortcuts, like using leftovers on hand, to streamline the preparation of this comfort food dish. 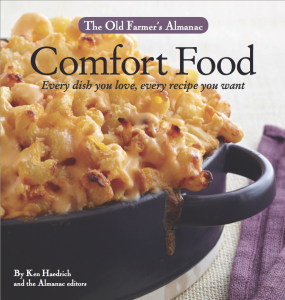 Between now and fall I’ll be giving you an occasional peek at some of the other great dishes in Comfort Food. So stay tuned. Meanwhile, have a fabulous week and go make some memorable food. 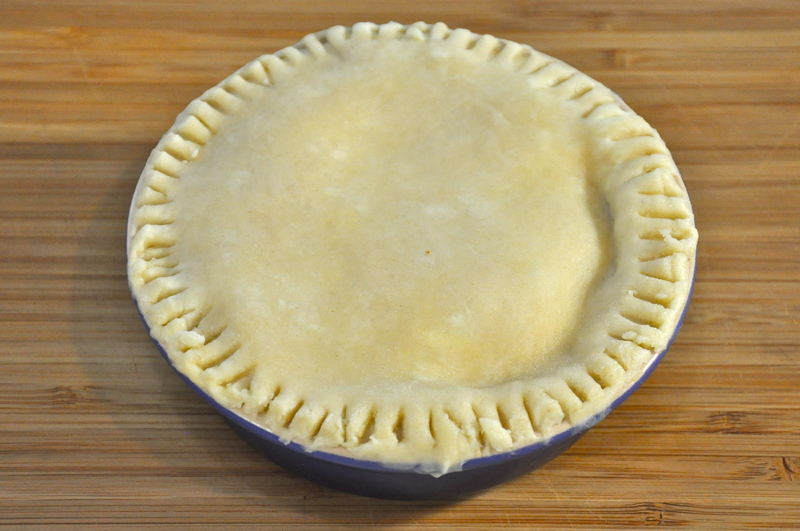 RECIPE NOTES – For the pastry, use either the GOOD BASIC PIE DOUGH or the FOOD PROCESSOR PIE DOUGH. 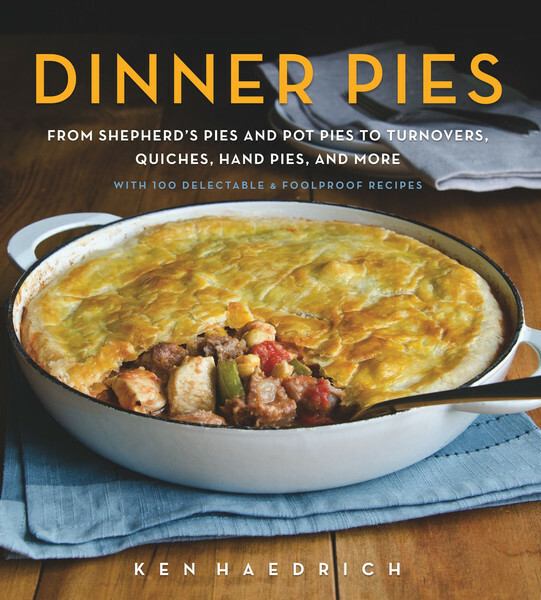 If you’re using a top and bottom crust for your pot pies (4 to 5 servings), you’ll need to make the recipe twice. For top crusts only, just make it once. FOR THE FILLING: Melt the butter in a large saucepan. Stir in the onion and celery, cover, and gently cook the vegetables over medium-low heat, until soft, stirring occasionally. Add the flour. Increase the heat and cook for 1 minute, stirring over medium heat. Add the stock to the pan; whisk well. As it begins to thicken, whisk in the milk, sage, and thyme. Simmer several minutes, until thickish. Stir in the chicken and vegetables. Continue to heat for 3 to 4 minutes, stirring, until heated through. Stir in the 1/3 cup Parmesan cheese and remove from the heat. Taste, adding salt and pepper to taste. Cool the mixture for at least 30 minutes. Working with one piece of dough at a time, roll the dough into a circle that measures 2 1/2" to 3" larger than your pan's diameter. (A 5" pan that's 1 1/2" deep, for example, will need a circle of dough almost 8" across.) Roll the dough slightly on the thin side. Line the pan with the dough, tucking it in gently. Refrigerate, then repeat for the other pie pans. Adjust your oven rack so it is one setting below center. Preheat your oven to 400° and get out a baking sheet large enough to hold the pie pans. 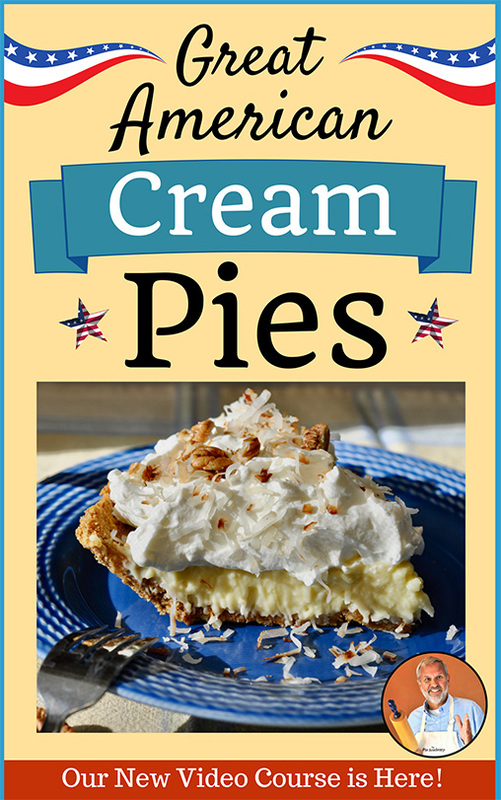 Get out the refrigerated pie shells and spoon enough filling in each one to reach the top of the pan. (For an extra hit of Parmesan, sprinkle a little extra cheese over the filling if desired.) Set aside. Working with the remaining pieces of dough, roll each one slightly larger than the pan's diameter. As you roll each one, lightly moisten the edge of the shell and attach the top pastry, pinching together at the seam. Roll and flute the edge or trim with a paring knife and crimp the edge with a fork (see video for more detail.) 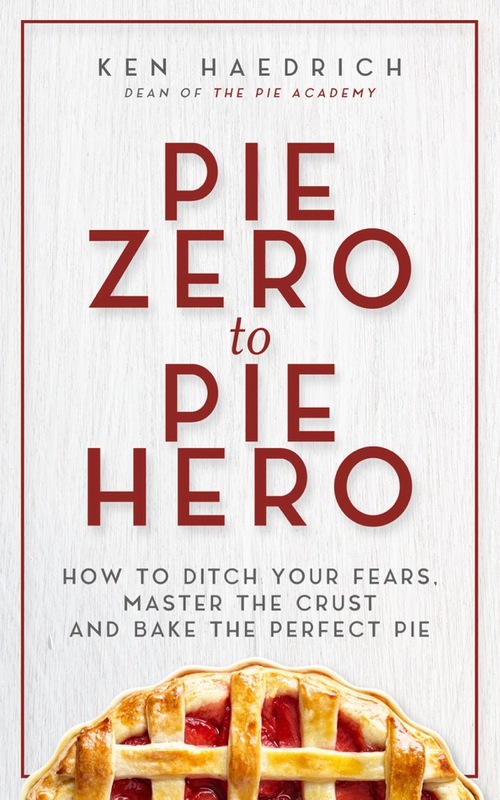 Repeat for all the pies. Lightly brush the top of each pie with some of the glaze. Using the tip of a paring knife, poke one or two small steam vents in the top of each. Bake for 35 to 40 minutes, until golden brown and the filling is bubbling hot. Makes 4 to 5 pot pies.